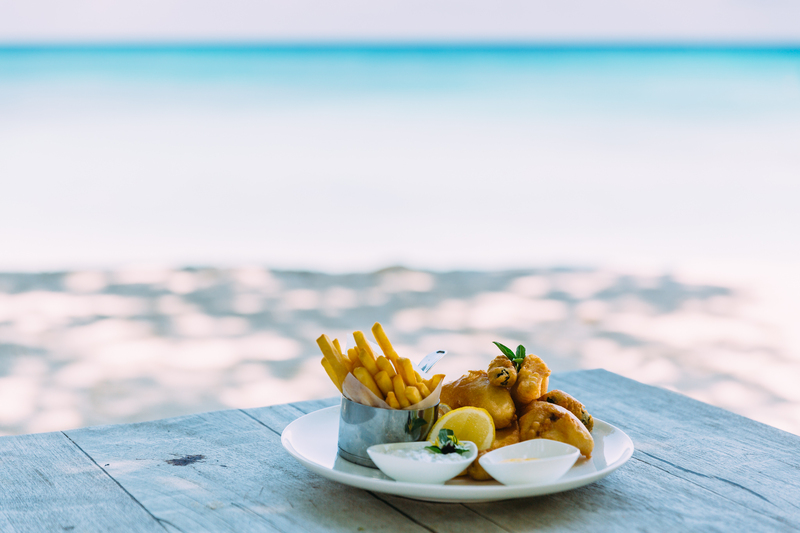 Enjoy freshly-caught Job fish battered in one of Seychelles’ finest brews. Served with tartar sauce, saffron mayonnaise and French fries. Green Job fish is a white, fleshy fish, popular in the Seychelles. When cooked, it is very tender, flakes beautifully and has a lovely subtle flavour. Our chefs catch Job fish sustainably from the waters surrounding North Island – you can’t get fresher. First make the mayonnaise by placing the egg yolks into the blender along with the mustard and white wine vinegar. Add the oil in a steady stream and keep blending until all the oil has been incorporated. You can also make this by hand in a bowl by whisking at the same time as adding the oil in a steady stream. Divide the mayonnaise into two bowls. Place the onions, gherkins, capers and parsley into one bowl, stir in some mayonnaise and check the seasoning. Place the saffron into the other bowl and add some strands of saffron, stir to bring the colour out. Place the oil into a frying pan and heat gently. Once hot, fry the French fries and cook until golden brown. Drain on paper towel and keep in a warm place. Cut the fish into smaller pieces, roughly 100g each, to make it quicker to cook. Place the tempura flour into a bowl. Add the Seybrew local beer and stir until combined. Dip the fish into the batter and drop it gently into the oil. Make sure the oil is hot by testing a piece of battered fish first. Fry the remaining fish until golden brown and drain on paper towel. Serve with the tartar sauce and saffron mayonnaise as well as wedges of lemons and limes.